Germany’s New Responsibilities in Global Policy - Atlantik-Brücke e.V. Germany has repeatedly expressed its readiness to assume increased international responsibility. The Federal Republic understands the global political framework and the available policy options; furthermore, Germany is aware of the expectations of both its European and global partners. In this context, it is particularly relevant to address the question of whether Germany recognizes its own identity as a key player in international security policy. The White Paper working group 2016 of the Federal Ministry of Defense and members of Atlantik-Brücke focused on this very question in an expert discussion round. The participants quickly reached the consensus that political decision-makers as well as think tanks and the media have led the public discourse on Germany’s involvement and responsibility in the world, and the general public should be participating in these discussions more. The participation phase of the White Paper Project 2016 has already successfully enabled an increase in public involvement. The experts agreed that it is important to proceed with caution in regards to security policy in the fundamental and core documents of the German Federal Government. 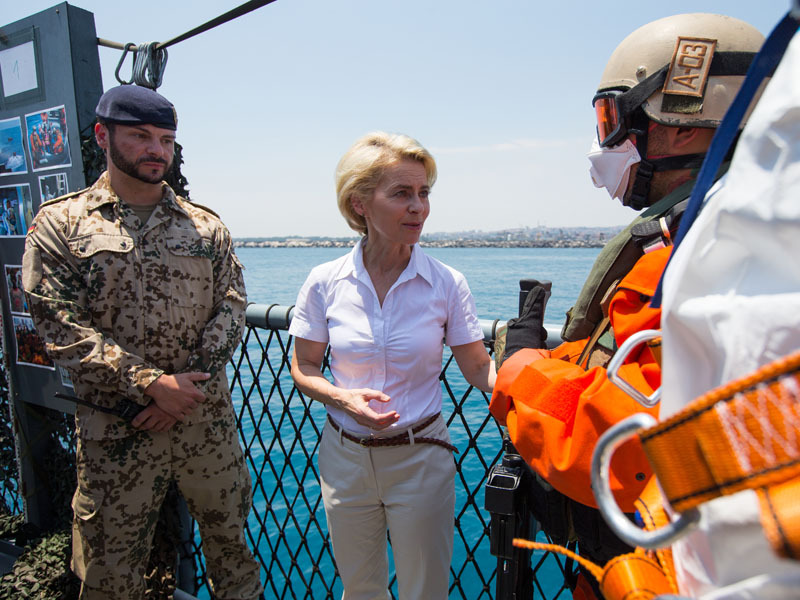 Goals should – when possible – be set in harmony and be proportionate with the resources and capabilities of the German Bundeswehr. The participants also recommended that it would be prudent to take into consideration whether a mechanism for verifying and, if need be, updating the fundamental security policy documents would enable a swifter, more effective response to developments in crises and conflicts. In this regard, perhaps a recommendation of the Commission for Verifying and Securing Parliamentary Rights in Regards to the Bundeswehr’s Foreign Deployment Mandates (In German: Kommission zur Überprüfung und Sicherung der Parlamentsrechte bei der Mandatierung von Auslandseinsätzen der Bundeswehr), under the leadership of former Defense Minister Volker Rühe, could serve as a starting point: the German Federal Government should document yearly which international alliances it is involved in and what specific obligations arise from them. Germany’s partners and allies want to see the German Federal Government dependably and actively engaged in international politics, particularly in questions of security and defense. Germany’s increased geopolitical responsibility is reflected in these expectations. The fact that Germany’s identity within the security realm is still being shaped and realized, is yet another incentive for its active participation in influencing future decisions and for it to provide support in the implementation phases. It is possible that majority rule as opposed to consensus decision-making would aid the institutions and states involved in the European Union’s Common Security and Defense Policy (CSDP) to improve their capacity for quick and decisive reactions in times of ever-increasing global insecurity. As the refugee crisis has demonstrated, the immediacy and time-sensitive nature of the crisis has challenged and compelled EU member states to coordinate political negotiations. Majority decision-making pertaining to the crisis has served as a litmus test for the states’ capacity to proactively respond in crisis situations. The participants in the expert discussions expressed that it is plausible that Germany will be an important contributor to strengthening Europe from the center outwards. More concretely, this means working on a larger scale and in cooperation with institutions like the United Nations, NATO, and the Organization for Security and Cooperation in Europe (OSCE), African Union, or the Arab League to not only utilize effective defense policy, but also in order to fulfill its responsibility to the global community. Furthermore, collaborative development work, especially in the German Federal Government, should focus primarily on integrating education policy and security policy. The international transfer of responsibility must be executed within the guidelines of a comprehensive, holistic concept and not be restricted to the military dimension. In the view of several participants of the discussion round, the German Federal Government is not alone despite its changing international role, especially in the European Union which is its immediate geographic and political sphere of influence. In particular, if the EU-States implement the Pooling and Sharing concept seriously and consistently, it would not only enable for the joint financing of technical devices and armament as well as their coordinated usage, but it would also help to alleviate the individual burden on states for educating and training soldiers and other military personnel. Other than the general expectation of increased efficiency, many experts also anticipate an estimated savings in the tens of billions. Through the successful pilot projects in cooperation with Poland and the Netherlands, Germany has already contributed to further cooperation and consolidation of European integration in the area of defense policy. Three possible dependencies and corresponding goals were another focus of the discussion’s participants: firstly, the high degree of exchange in free trade and of investments between European states; secondly, peace and security; and thirdly, the stability of their democratic systems. The moral imperative to protect freedom itself emerges from these considerations. The experts recommended to select and shape the proceeding action plan in such a way that it will not become obsolete in light of inevitable changes to international security policy. The strategy must be robustly planned and represented, in order to allow for flexible and adaptable security policy reactions even on short-notice. Certain premature considerations in regards to potential missions could prove to be a hindrance for some defined objectives, for instance if the White Paper working group was to describe and define no-go areas in which Germany should not engage in. The developments in the Ukraine conflict as well as the threats of the terrorist organization IS in Iraq, Syria, and Libya have made it abundantly clear how difficult it is to foresee – even drastic – political changes. New security developments can also lead to redefined priorities; however, on the meta-level, the constant must remain that German Federal Government’s defense policy imposes restraint and remains primarily defensive as opposed to starkly offensive. This also belongs to a pragmatic view of Germany’s new responsibility in global policy.